United Cakedom: Cinnamon Roll Hearts!! These are easy and perfect for Valentine's Day!! Or any time you want to show someone you love them!! Buy a roll of your favourite cinnamon rolls (like these ones) and unroll them about half way. Then re-roll them the other way to from a heart shape! Make a bend for the pointy bit at the end! Who doesn't like heart shaped breakfasts!! note from Lisa: In America it is not uncommon to eat cinnamon rolls and doughnuts for breakfast!! Pillsbury cinnamon rolls are not available in the UK and I don't know of any alternative ATM. UPDATE: (8/2/16) Jus Rol are the UK equivalent to Pillsbury products, they are the closest you will find! 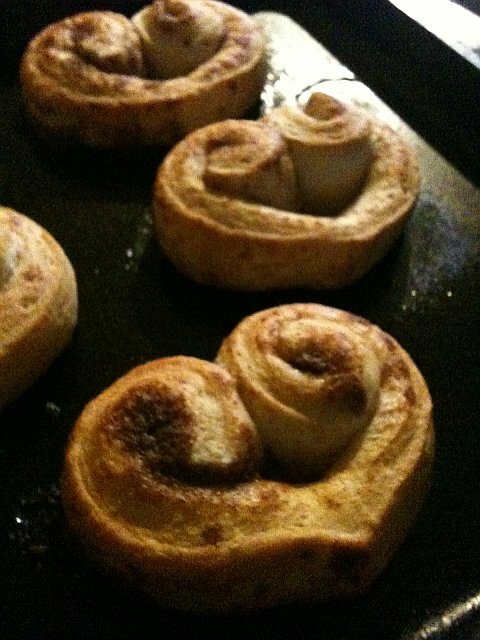 Their Cinnamon Swirls would easily make these! I'd love to make these for my kids on Valentine's Day. Do you have any idea where I can find cinnamon roll dough in England? Homemade Laundry Soap by Janet!! Shrove Tuesday aka Pancake Day!! Blueberry Cupcakes for Baby Bakers Birthday! Goodbye Men, Hello Dolly Squares! !